Imagine that all you see through your eyes is in fact through a Vaseline film. That is how a baby perceives the world around him. It is a confusion of shadows and unknown forms. But this won’t last forever; soon he will be capable of seeing and watching colors around. Let’s get an insight into your baby’s world through his eyes. During the first weeks, the baby’s vision is blurred, says Susan Day, M.D., children ophthalmologist at the California Pacific Medical Center in San Francisco. There is proof that a baby can distinguish somewhat good between an object held by an arm at a distance of eight to fifteen inches, as well as an attraction for human faces. This is good: it means that when held in the arms or breastfeed, a baby can actually see with enough clarity to distinguish what she is looking at. Simple ways to encourage visual stimuli to your baby: Bring your baby to the supermarket, it is fascinating to see all the colors and forms of boxes and food packages, even if they cannot be seeing that clear. 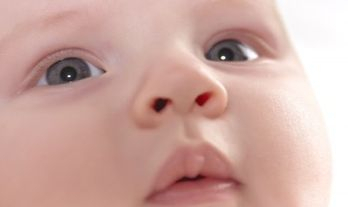 Around week six of birth, babies will perfection the ability of “following” objects with her eyes when the object is slowly moved close to the face. When reaching the third month after birth he will follow objects with a better eye movement. Have you ever wonder why there are so many toys in black and white for babies? It is because; babies distinguish a lot much better colors that play contrast between each other, like dark colors and whites, rather than pastels. That is why your baby will probably look at the top of your head instead of your eyes. Around two months after birth, your baby will start to look at you directly and to feel more interest for primary colors. Show bright colored objects like a green ball or a yellow box. It is all about bright single patterns for your baby to explore with his eyes. Between three and six months, your child will see object in 3-D. As the coordination between eyes and hands is developing at the same time, he can try to reach objects standing in his front, spontaneously at first, and then deliberately. Be careful with your earrings, your baby will go for it! By this time your little one can see objects and people across a room. At six month, sight had flourished. This means that your baby can perceive the differences among pastel colors and measure distances to reach objects. She will also try to crawl, an ability requiring visual skills. If there is a small toy close to her, she will try to reach it by any means. Another little detail: your baby will cry more often. When born, the tears generated by a baby are in fact to maintain eye lubrication, but around seven to eight months up to one year of age, his crying will be because of emotions generated by your baby, such as anger, pain or frustration.